It's been cooler than normal in a lot of places this week but never fear, summer IS coming! This weekend's $1000 Summertime Slots Raffle at Intertops Poker and Juicy Stakes Casino will really start to heata things up! Starting tomorrow and continuing through the weekend this weekend earn free raffle tickets when you play Betsoft games depicting favorite summertime activities like travelling, fishing and going to the movies. 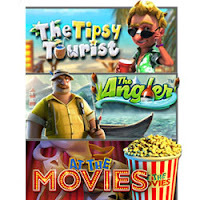 The Tipsy Tourist, At the Movies and The Angler all have lots of free spins, bonus games, Wild multipliers and scatter pays. June 14 – 17, automatically earn raffle tickets when you play the Summertime games. The Tipsy Tourist follows a hardworking fellow who sets off on a fabulous holiday. Gary guides players through many exciting bonus features, such as the Double Up Mini Game. 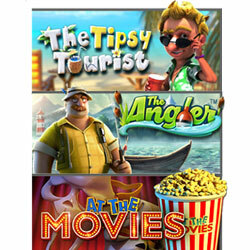 The Free Spins mode and Scatter Pays offer many chances to win, and players can join Gary in a drinking contest in the interactive Bonus Round. At the Movies brings the magic of the cinema to the casino. Its Wild doubles wins and scatters award up to 20 free spins where wins are doubled. The Angler features burly fisherman Otis and his endless quest for the perfect catch. The fishing trip features Oyster Free Spins and Clingy Wilds, a frequently occurring Wild symbol and an innovative Time to Fish bonus game. To help you relax this weekend, take part in Intertops Poker and Juicy Stakes Casino's $500 GTD Weekend Bounce tournament. Intertops Poker and Juicy Stakes Casino are the busiest poker rooms on the Horizon Poker Network which welcomes all kinds of players from all over the world. They also offer slots and other casino games from Betsoft, Worldmatch and Lucktap. You can win your way to the Saturday night Final in one of three $0.55 qualifying satellites which will be held earlier in the day. In addition to the $500 guaranteed prize money, you'll also earn $1 for each opponent you knock out. Register for daily tournaments by clicking the Tournaments tab in the poker room lobby at either Intertops Poker or Juicy Stakes Casino. Buy-in for the Final is only $9. 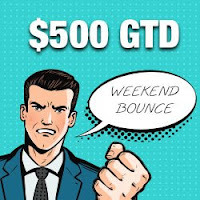 Further information on the $500 GTD Weekend Bounce poker tournament is available at Intertops Poker and Juicy Stakes Casino.